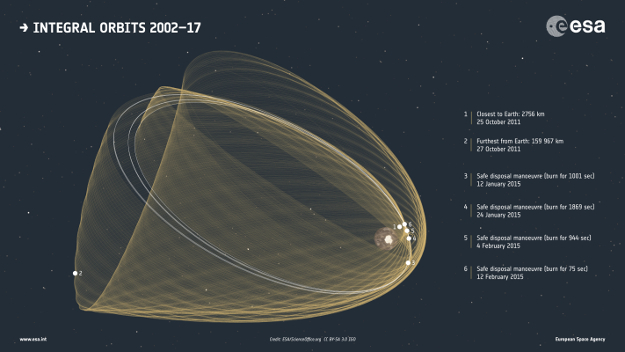 This image depicts the evolution of the orbit of ESA’s INTEGRAL spacecraft from launch on 17 October 2002 up to October 2017. INTEGRAL observes the ever-changing, powerful, and violent cosmos. It is the first space observatory that can simultaneously observe objects in gamma rays, X-rays, and visible light. In 2015, spacecraft operators conducted four thruster burns that were carefully designed to ensure that the satellite's eventual entry into the atmosphere in 2029 will meet the Agency's guidelines for minimising space debris. The orbital changes introduced during these manoeuvres are highlighted in white.